Android emulator is getting more important than any other software because people want to run their Android apps/games in PC or laptop. Mobile Android apps are tested on these Android emulators for pc because releasing to market. Developers know that their app can only get success in the market if their app is running on Android emulator for windows and ios. Today we are going to provide you the best emulator which are very famous and useful in the android market. I think you people also want to run WhatsApp in your PC or laptop and it is possible by these best emulator. In the software industry, there is a lot of Android emulator but after a lot of research, we have prepared a list of the free emulator to play android apps and games on PC. Android emulator can help you in playing apps and games in pc. Lets download below emulators and install in your computer and enjoy computer as android OS. 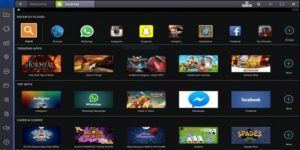 Bluestacks is one of the most famous app player software in this world. BlueStacks is an American technology company who develop lot of such app player and cross platform software. This software is design to run all the Android apps in our laptop or pc and after the development of this software, developer have proved that everything is possible in software industry. If you are thinking to run android apps on pc then you have to download this software in your mobile. If installation we will feel that your pc has become your mobile. Please do read the detailed article also! Andyroid is also deserve to take position in list of top 10 android emulator. It provides best synchronous in between desktop and android mobile. With the help of this software, you can download any android app in your pc or laptop. That’s why, it is of the best Android emulator. This software has been awarded by best emulator by the users because of its good features and reliability. You can enjoy latest update of any android app on your desktop. Even it also supports external devices like joystick, mouse and keyboard also. Read the detailed article here. There are lot of features in Geny Motion app player like it is very fast, easy and reliable at anywhere. It provides a unique way to connect our android mobile with desktop or laptop. This Android emulator is free for personal use and if you are thinking to use it as commercial then you have to pay some money so that you can complete features in your business. KO Player is available for both windows as well as Mac. That’s why, most people are using this wonderful emulator software. It is much more popular than other emulator in terms of games. It comes at second position when we search about best emulator for games. Even we can download it easily from Google play store. If you people want to play android games in your pc then this android emulator should be your best choice. Because of this feature, it is best emulator for games. Windroy provides a wonderful look to users and look like a classic software which is its best quality. Users said that this software work outstanding in older version of windows. If you do not like games then it is best for you because it is less reliable for games. We can download it freely and can enjoy your android mobile in our pc or laptop. Amidu Os is one of the fastest android emulator who help us to run android apps In our pc or laptop. This software is free for first 30 days but after that we have to pay some amount to use its premium version otherwise it will get expire. It brings good functionality, fun and depth in our pc while running android apps in it. We can run it on any device like pc, laptop and even in tablet also. There is lot of many reasons due to which it is a best choice of users. Developer said that Memu is better software as compare to BlueStacks. It provides better functionality and full accessibility to all the apps. Even it is also one of the best emulator for those who want to play android games in their pc. Because of its beautiful look and features, it taken place in list of top 10 android emulators. Users have given good rating to software and they are suggesting other people to use it in their pc or laptop. Nox Emulator is also a games playing emulators and good for those who love to play games. It software is published in 2000 and develop by Electronic Arts. It is also a good choice for those who are planning to install android emulators in their Pc or laptop. After lot of observation, we found that users are giving good reviews about this software and appreciating its features and beautiful look. So enjoy this games android emulator. Remix app player looks quite good and decent. It supports both AMD and Intel chipsets which is a wonderful feature in Remix OS emulator. This is one of the best reason to install this android emulator in your pc. It supports all the latest Android OS like Kit Kat, Jelly Bean and Lollipop. If you thinking to enjoy Android emulator then remix Os Player is best Android emulator for you. Very soon AmiduOS software is going to take first place in the list of top 10 emulator. If you are looking to install this software then you can easily install it and can enjoy its free trail for few days but after some days you have to play some money for it. As it is new Android emulator but it has potential to get famous in market. We can use it for both home purpose as well as office also. It also provides good features for those who love to play android games in pc. So these are top rated emulator to play android apps and games in your computer. I personally used 6 android emulator from above list and the rest emulators are listed on the base of other bloggers and forums. Lets use above emulators and tell us which one was best for you in comment section.